Two million home break-ins are reported every year in the U.S. That’s one every 15 seconds. Yet only 17 percent of homes have home alarm systems. To protect your home, property and family against a break-in, start by learning how it happens. You’ll quickly see home alarm systems can provide extraordinary value to protect your family. And once you understand how home alarm systems work, you’ll be prepared to make the best investment possible. According to statistics, 30 percent of home break-ins begin with an unlocked door, window or other opening. That’s nearly a third of all such events. 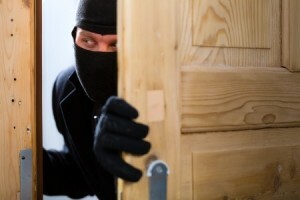 Out of the burglaries reported in the U.S., 66 percent are home break-ins. Of those, 33 percent get in through the front door. Reports vary, but data suggest most break-ins require force. Usually, this involves kicking in the door, and breaking the lock strike-plate and bolt out of the frame. Up to 25 percent of burglars admit to cutting home alarm wires or telephone wires to disable home alarm systems before breaking in. However, only 17 percent of homes in the U.S. are equipped with home alarm systems. Burglars often return to homes they’ve victimized before. They know there’s stuff to steal, and they know how to get in. If your house has been broken into and you don’t have a home security system, don’t think it won’t happen again. Now is the time to invest in a home alarm. Only about 13 percent of burglaries are solved, and in even fewer cases is property returned. Thieves will usually bypass a house that appears difficult to enter. When you move into a new home, change all the locks. Choose deadbolt-type locks that are separate from the doorknob, and that have a heavy-duty strike plate with three screws into the door frame. If your entry doors are made of hollow wood, replace them with solid-core or steel entry doors that are hard to penetrate. Open windows in an empty house are practically an invitation to a burglar. Make sure all doors and windows are locked when you leave your home. This includes exterior storm or screen doors. A burglar can use an unlocked screen door to hide from neighbors when breaking through a locked entry door. Sliding glass doors are secured by latches that are relatively easy to break. Make them more secure by placing a wooden dowel or small board into the door track so the door cannot move. Most break-ins occur during the day, when homes are usually empty. Often, a burglar will ring the front doorbell to determine whether anyone is at home. If no one answers, he can break into the back door or through a window, where he’s less likely to be seen by a neighbor. You can install timers on exterior and interior lights to simulate activity in your home when you’re away. Your best security when you’re not home are quality alarm systems. Choose one that includes an audible horn or another alert, and is monitored by a central office that can notify police if the alarm is triggered. Often, your fire alarm can be connected so that the monitors can notify the fire department if needed, as well. Alarm systems often include decals that you can stick onto your front door or window to indicate your home is protected. Thieves will usually bypass houses with this sticker. They’re looking for houses that are easy to break into. Just having a home alarm system will often keep thieves from even trying your home. BP Alarm Home Security Systems can help guide you to the right choice in home alarm systems. Give us a call at 888-376-4057 or email us at info@bphomesecurity.com. We are your source for Salt Lake City alarm system expertise.